A broad-bodied chaser dragonfly by the wildlife pond at home. 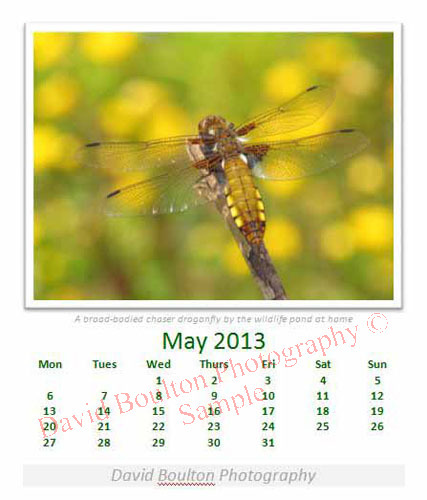 PLEASE NOTE: Each calendar has been printed to a high quality. When these images are prepared for the web they have to be reduced considerably in size to 72dpi and thus when enlarged the image quality is not good, but it shows the photograph and the layout of the page including the calendar/dates etc. Some words may appear to be "underscored in red" on the images (but this does NOT appear on the actual calendars)! It is a spelling feature that the software shows on the PC screen for words it doesn't reconise when creating the calendars and only shows on the PC "Word" file...NOT the printed calendars!